Scenario analysis is a process of examining and evaluating possible events that could take place in the future by considering various feasible results or outcomes. In financial modelingWhat is Financial ModelingFinancial modeling is performed in Excel to forecast a company's financial performance. Overview of what is financial modeling, how & why to build a model. A 3 statement model links income statement, balance sheet, and cash flow statement. More advanced types of financial models are built for valuation, plannnig, and, this process is typically used to estimate changes in the value of a business or cash flow, especially when there are potentially favorable and unfavorable events that could impact the company. Most business managers also use scenario analysis during their decision-making process to find out the best-case scenario as well as worst-case scenario while anticipating profits or potential losses. Individuals can use this process when they have a big investment coming up like purchasing a house or setting up a business. This guide will help you understand why scenario analysis is important and how to perform it yourself. Generating cases to be used in Scenario Analysis? When performing the analysis, managers and executives at a company will generate different future states of the business, the industry, and the economy. These future states will form discrete scenarios that include assumptions such as product prices, customer metrics, operating costs, inflation, interest rates, and other drivers so of the business. Base case scenario – this is the average scenario based on management assumptions. An example – when calculating the net present value, the rates most likely to be used are the discount rate, cash flow growth rate, or tax rate. 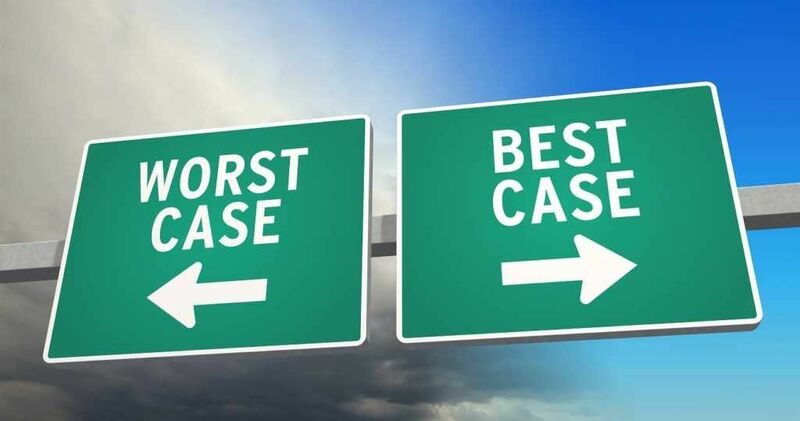 Worst case scenario – considers the most serious or severe outcome that may happen in a given situation. An example – when calculating the net present value, one would take the highest possible discount rate and subtract the possible cash flow growth rate or the highest expected tax rate. Best case scenario – this is the ideal projected scenario and is almost always put into action by management to achieve their objectives. An example – when calculating the net present value, use the least possible discount rate, highest possible growth rate, or lowest possible tax rate. Building scenarios into a financial model is an important exercise to help cater for uncertainty. Below is a screenshot of scenarios being built in CFI’s Sensitivity & Scenario Modeling Course. 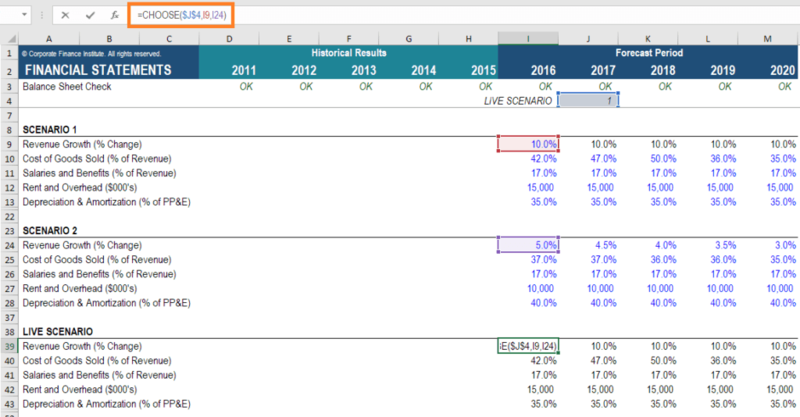 Link the “Live Scenario” numbers directly into the financial modelWhat is a Financial Model?A financial model is a representation of a company’s past and future performance based on it's assets & operations. Find out: what is a financial model? Get this template in CFI’s Sensitivity & Scenario Modeling Course. What are the benefits of performing Scenario Analysis? THere are many reasons why managers and investors perform the analysis. Predicting the future is an inherently risky business, so it’s prudent to explore as many different cases of what could happen as is reasonably possible. Future planning – gives investors a peek into the expected returns and risks involved when planning for future investments. The goal of any business venture is to increase revenue over time, and it is best to use informed calculations when deciding to include the investment in the portfolio. Proactive – Companies can avoid or decrease potential losses that result from uncontrollable factors by being aggressively preventive during worst-case scenarios by analyzing events and situations that may lead to unfavorable outcomes. As the saying goes, it is better to be proactive than reactive when a problem arises. Avoiding risk and failure – to avoid poor investment decisions, scenario analysis allows businesses or investors to assess investment prospects. It takes the best and worst probabilities into account so that investors can make an informed decision. Projecting investment returns or losses – the analysis makes use of tools to calculate the values or figures of potential gains or losses of an investment. This gives concrete, measurable data that investors can base the approaches they take for a better outcome. What are the drawbacks of Scenario Analysis? Scenario analysis tends to be a demanding and time-consuming process that requires high-level skills and expertise. Due to the difficulty in forecasting exactly what takes place in the future, the actual outcome may be fully unexpected and not foreseen in the financial modeling. It may be very difficult to envision all possible scenarios and assign probabilities to them. Investors must understand that there are risk factors associated with the outcomes and they must consider certain risk tolerance to be able to pursue a goal. Watch this video demonstration of how an analyst would set up a scenario management system in a financial model. By watching the step by step instruction you can then try to perform the analysis on your own. The above video was taken from CFI’s scenario and sensitivity analysis course, which covers the topic in much more detail. Thank you for reading CFI’s guide to scenario analysis for financial modeling. CFI is the official global provider of the Financial Modeling and Valuation Analyst (FMVA)™FMVA™ CertificationThe Financial Modeling & Valueation Analyst (FMVA)™ accreditation is a global standard for financial analysts that covers finance, accounting, financial modeling, valuation, budgeting, forecasting, presentations, and strategy. certification, designed to transform anyone into a world-class financial analyst.